Ludwig’s atelier is home to this sculpture of a mechanism. 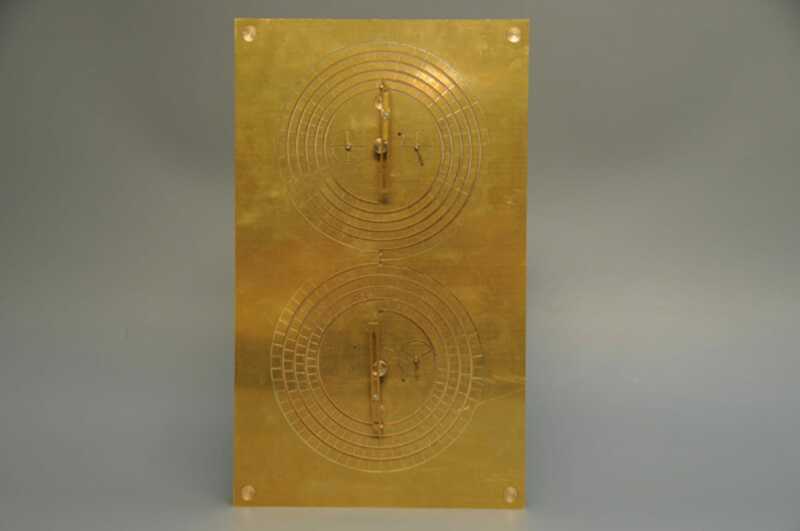 The Antikythera mechanism! Vico interpreted and reconstructed it in the course of his work for ochs und junior. It is the first known cogwheel- and-calendar construction. In 1900 sponge divers discovered a shipwreck at a depth of 60 m off the Greek island of Antikythera. The wreck yielded a number of statues and other artifacts. Then in 1902 archeologist Valerios Stais spotted a cogwheel in one of the chunks of corroded material. Subsequent studies revealed that this wheel was part of a kind of analogue computer for determining the movements of the sun and moon. Oechslin’s reconstruction of this important calendar is the third ever attempted, and will be donated to the Musée International d’Horlogerie (MIH) in Switzerland. Ludwig’s scientific and academic work forms the foundation of ochs und junior – and hence of all our timepieces.